I think Kristin had the right idea when she wrote this post, politely shooing winter out the door with a list of things she'd miss about the long, cold season. With that in mind, I figured I'd write about soup today, before the warm weather finally hits (soon? please?) and the only soup we'll be eating starts with corn (fresh, sweet, local, summer) and ends with chowder. But first, potato soup -- one that I made for the first time in November, when I was still so excited for soups, and there was a feeling of holidays in the air to mask the impending doom of winter. The photos have been sitting in my Flickr stream since then, waiting patiently for their turn, but I just never got around to sharing the recipe until now. I guess I thought it wasn't worth a blog post. After all, it's just an everyday potato soup. But I've made it a handful of times since then, and the soup made a comfortable home in our weekly rotation of meals. It helped us get through the winter, and that's certainly nothing to just shrug over. There's not much to it, really. You even use the microwave to cook the potatoes. The original recipe also tells you to cook the bacon in the microwave, which I tried, but decided that the saved time isn't worth it. Bacon should be pan-fried, period. You peel the skins from the cooked potatoes and throw the potatoes into a pot with garlic, onions, broth, flour and milk, and then mash it all up. The results, once you've made up your bowl with bacon bits, green onions and cheese, is a baked potato in the form of a soup. If it's still chilly in your neck of the woods, you may still have time to make this. If it's warm where you are, well. I'm jealous. So now that you know about the soup (scroll down for the recipe), I'll leave you with some photos of here, lately. Maybe they'll also help give winter that gentle nudge it needs to get out of here already. Pierce potatoes with a fork, place on a plate and microwave on high for 13 minutes or until tender. Cut in half and let cool. Meanwhile, cook the chopped bacon in a skillet until brown and crisp. Set aside on a plate lined with paper towel. Heat oil in a saucepan over medium-high heat. Add garlic and onions and cook until translucent and fragrant, about 2-3 minutes. Add broth. Whisk together flour and 1/2 cup milk in a small bowl, and add to the pan with the other 1 1/2 cups of milk. Bring to a boil, stirring often. Cook for another minute, then remove from heat and add sour cream. Once the potatoes are cool enough to handle, peel off the potato skins, using a spoon to scoop the potato out of the skins. Discard skins, roughly chop the potatoes and generously sprinkle seasoned salt over them. Add the potatoes to the saucepan and mash until it's the consistency you want. We like ours thick and chunky. Season with more seasoned salt (or regular salt) and pepper to taste. 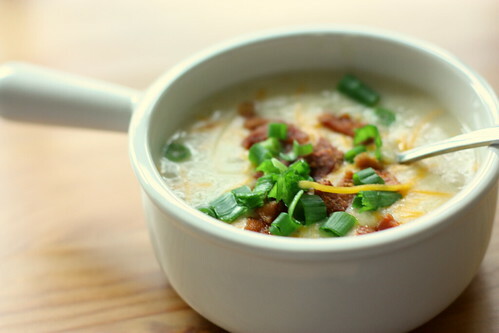 Top individual bowls with cheese, green onions and bacon. Serves 4, and is perfect alongside a crunchy salad. 1. i might be repeating myself here, but the LIGHT in your spring pix is so very achingly pretty. 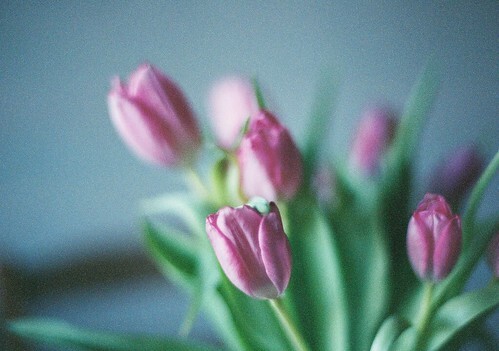 2. i love tulips, you capture them so beautifully. 3. i like soup during any season. Yes! So happy to be teaming up on this kick-winter-to-the-curb business, Jacqui. And those spring photos. Wow. So pretty, so hopeful. OK, first of all, that soup looks divine right now--pure comfort, winter or not. Second, your pictures! they kill me! 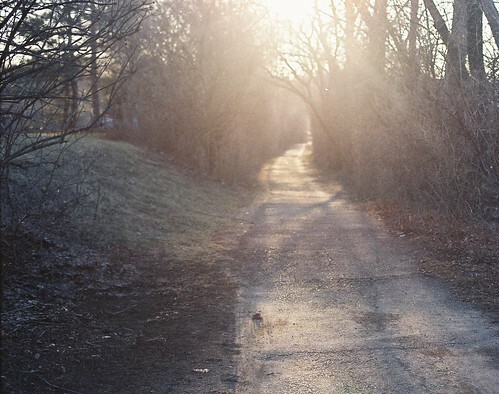 I especially love the one of the tree-lined path: that light! oh, my. It's so funny that you didn't think this soup was worth a blog post. For me, it's a revelation: you don't have to cook it on the stovetop for 2 hours while the flavors meld? Um, where has this soup been my entire life?! And a note on the pictures: wow. I don't mean this the wrong way, because I know some people abhor graininess in photos, but I adore the grain here. It lends this really warm texture to your pictures; I feel like I could reach in and pick those white tulips. Lan - Light is rare around these parts lately. I ache for more. And you're right, soup is good any time of year. Who am I kidding, I'll probably make this soup over the summer. Or next week. Or both. Nicole - Bacon just tastes better when I've got oil spatter burns on my arm. I earned that bacon. Shanna - That path is my favorite spot in my neighborhood. I think I have a photo of it during every season. Thank you! Maddie - Ah, that grain! Such is the beauty of film. I took those photos with a Canon 35mm SLR that a cousin-in-law gifted me, with film found in its camera bag (When people find out you like film cameras, they give you their old cameras! Win-win!). 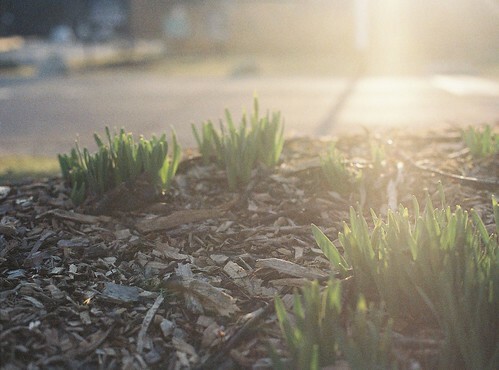 I love film grain -- it lends that magical quality to photos that digital can never reproduce. Thanks for your comment, and definitely try this soup -- really quick, easy and delicious. This soup recipe and the accompanying photos are the perfect nudge towards spring. I can't wait to try this soup as I think it could easily sustain me through a typical wet Vancouver spring/summer. 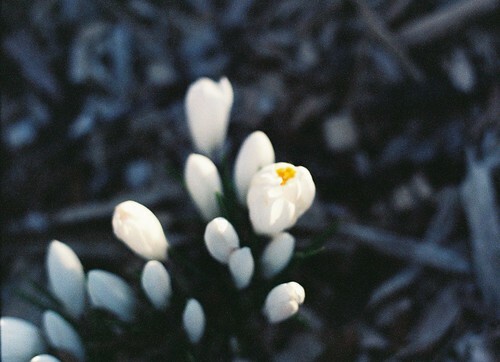 PS I am in love with your photo of the white crocuses. Julie - thank you! It's a great go-to potato soup. I hope you like it! The burgeoning tulips are nudges to sister winter but also to our hearts to burst and and bloom in this beautiful world!